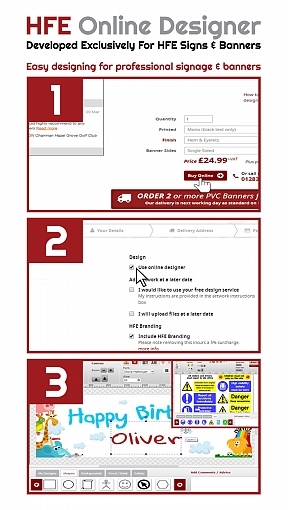 Browse the HFE Signs website to find the product(s) you require, select the sizes and quantities of each item along with any other parameters available. Tip, if you require different designs on the same products, (i.e. 2 banners the same size with different artwork) add it to your cart twice rather than clicking quantity 2, this will allow you to design each item in your basket separately. You can now begin designing your first product, you can insert images, upload your own files and much more.. If logged in you can save and come back to your design, you can even access all of the files you’ve previously designed in the designer. The designer is capable of anything from party banners to professional business signs. Tip, if your product is double sided, you can copy your first side to the second and edit accordingly..